Be the first to share your favorite memory, photo or story of Rhina . This memorial page is dedicated for family, friends and future generations to celebrate the life of their loved one. Rhina Ligia Cano de Carmona passed away peacefully on Thursday, January 31, 2019 in her home in Silver Spring, MD. Rhina was born on April 30, 1933 in Santo Domingo, Dominican Republic to Arsenio Cano and Luz Maria Mejia. 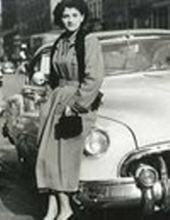 Rhina immigrated to the United States in 1944 with her sister, aunt and cousin to reside in New York City. In 1954, she married her husband of 64 years, Guillermo Carmona, and moved to Bridgeport, where they welcomed two sons. After moving to Stratford, a daughter arrived. For 23 years, Rhina worked for General Electric in Manhattan, Fairfield and Bridgeport, retiring in 1995 as an executive responsible for engineering recruitment and training. She had been employed previously by Nestle in Stamford, and she also had been a co-owner of The Pink Poodle in Manhattan and Valcan in Stratford. Throughout her life, Rhina was joyfully engaged in her church and community. She was involved in Cursillo ministry and sang in her church choir. With her husband, Rhina established the Adoration Chapel and annual Our Lady of Guadalupe celebration at St. James Church in Stratford. She was also involved in scouting and a few political campaigns. Rhina loved to cook, travel, read and dance, and relished an ice cold mug of beer and Los Mets. She was a proud member of The Red Hat Society. While fiercely dedicated to her family, Rhina would lovingly mentor anyone seeking guidance and support. In 2002, she was honored as Connecticut Post Woman of the Year, primarily for her work in prison ministry. Rhina is survived by her husband, son Roberto (Lisa Brailey) of Derby, daughter Maria (Ari Fitzgerald) of Silver Spring, MD, grandchildren, Pilar, Isel, Lourdes and Nicolas, brothers Maximo, Rafael Jose, and Arsenio Cano, numerous nieces and nephews, and family by marriage. She was preceded in death by son Carlos, and siblings Thelma, Danilo, and Enrique. A memorial mass for Rhina will be at St. James Roman Catholic Church in Stratford on Saturday, February 9 at 10:30 a.m., with interment to follow at Gate of Heaven in Trumbull. Memorial contributions may be made to Kairos Prison Ministry, P.O. Box 571, Tariffville, CT 06081. To send flowers or a remembrance gift to the family of Rhina Ligia Carmona, please visit our Tribute Store. "Email Address" would like to share the life celebration of Rhina Ligia Carmona. Click on the "link" to go to share a favorite memory or leave a condolence message for the family.